Samsung Electronics co., Ltd. announced in its latest and first Samsung smartphone with Triple Camera, the Galaxy A7. A7 is the latest addition to the Galaxy A series family packed with powerful rear triple camera, sleek design and must have everyday features. Samsung is committed to delivering meaningful innovation to all consumers across the Galaxy family, no matter who they are or where they are in the world... That’s why we’re excited to introduce innovative new features to the A series with the Galaxy A7, a practical but powerful device that is built to help make your everyday both convenient and extraordinary. Featuring a premium 6.0-inch Super AMOLED display, the Galaxy A7 lets you experience and share the world as you see it. Adding on, Samsung’s signature Infinity Display makes the most of uninterrupted, immersive viewing. The Galaxy A7 also supports Dolby Atmos® immersive sound technology, which brings entertainment to life through moving audio that flows all around you. When it comes to style, the Galaxy A7 does not compromise. Coming with a premium glass design, a side fingerprint sensor for greater convenience and smooth seamless curves, it’s both practical and comfortable in your hand. 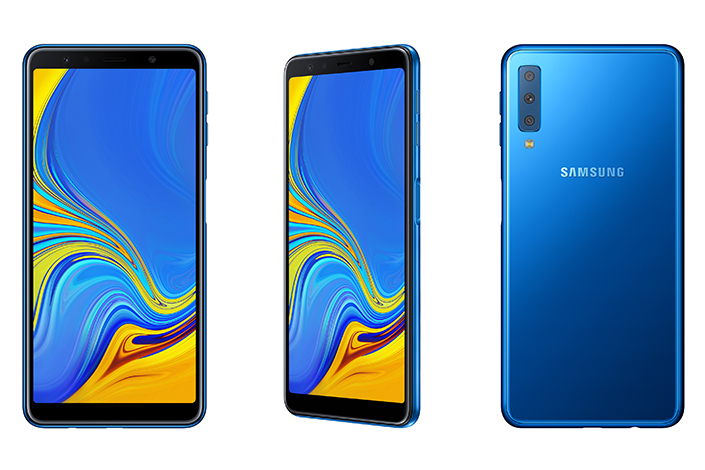 Just like its Rear Triple Camera, the Galaxy A7 will be offerred in three stylish colors to suit your personal style – blue, black, and gold. It also comes with Bixby and Samsung Health. No info yet about the price for the 2018 Samsung Galaxy A7, but it should be available soon! How much do you think it will be in retail?